Under the Privacy Act’s Information Privacy Principles you must be told why your personal information is being collected and whether it can be given to anyone else. Private information of thousands of Australian jobseekers harvested through medical examinations and stored for profit has raised legal and applicant concerns about the protection and use of personal data. Australia’s largest publicly-listed health and risk management provider, Konekt, has collected the personal data of jobseekers since 2007 through medical examinations on behalf of private companies and government agencies as part of employment selection processes. Screened at purpose-built clinics operating in every state and territory, jobseekers have their personal information collected by Konekt health professionals on behalf of government, building, construction, manufacturing, health, mining, transport, logistics, hospitality, retail and labour hire industries across Australia. Screened at purpose-built clinics operating in every state and territory, jobseekers have their personal information collected by Konekt health professionals on behalf of government. The collected private information, including physical and psychological assessments, is stored electronically and provided to the “referring employer”. 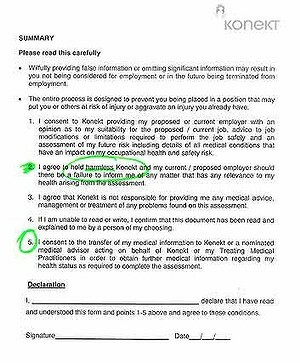 Contractor and potential employee Michael* told Fairfax Media he was asked to complete a medical examination with Konekt in order to secure his contract position. He said he immediately felt uneasy about the process and was concerned his personal information would be used beyond being considered for job suitability. “Why do they need all that information?” he said. He said prior to his appointment his request to Konekt to have all paperwork supplied to him before his examination was refused. A Konekt spokeswoman said potential employees were given 30 minutes “so they can review and complete paperwork which includes the consent form”. At the end of the medical, Michael said he signed a “medical information clearance declaration”. The 160-word legal paragraph would “waive all provisions of law as to privilege or otherwise forbidding disclosure of such information” or allowed Michael’s protected personal information to be used by parties other than those who gathered the information, such as the potential employer. Michael said applicants needed to be clearly told what would happen to personal information collected from the examination. Slater and Gordon’s industrial and employment lawyer Simon Millman said many people were still unaware it was illegal for personal information to be used for purposes other than originally intended. “You provide consent [for personal information to be collected] because you believe the information is to be used for a specific purpose. After the examination, Michael said he felt uneasy that his personal information was to be stored in a “massive library” by a business, not by his doctor, and submitted a request for the information to be returned. Michael wrote to Konekt requesting the return of his personal information and all records destroyed. He said his personal information was eventually returned after several requests, however, there appeared no specific procedure for the return of personal records. A Konekt spokeswoman said “if the individual requests access to their results it is provided to them directly”. Michael said he believed personal information which was otherwise illegal to use without owner permission was being gathered and stored for employers to use against future injury and safety claims by employees. “What was worse was they were telling me the examination is all about safety,” he said. “They say it because anything linked to safety cannot be criticised. “What it’s about is reducing the risk of fraudulent claims. Konekt states on its website it is the largest private sector provider of “organisational health and risk management solutions in Australia” and provides a range of health services and “cost containment”. With its focus on identifying health and safety risks in potential employees, Konekt states in its 2013 annual report that the company’s “vision is that it leads the way in making Australian workplaces injury free by 2025”. Konekt CEO Damian Banks said in a statement Konekt was largely in the business of conducting functional employment assessments. “Information collected is stored electronically in Konekt’s secure case management database. “This database is stored at a secure offsite facility run by one of Australia’s leading technology companies. “Information collected during the assessments is not made available to any other third party. “Konekt does not sell information other than charge the requestor for the receipt of the reports and associated analysis,” Mr Banks said. Jobseekers for positions with some of Australia’s largest companies and government agencies are required to undertake physical, medical and, sometimes, psychological examinations to determine job suitability. Information from weight, height, eating and sleeping habits, pre-existing conditions and illnesses are recorded. On presentation to the examination, applicants are asked to read and sign consent forms authorising “to exchange information and medical questionnaire”. Your personal information from your doctor cannot be provided to a third party without your knowledge or consent. You also have the right to see what information is held about you and have it corrected if it is incorrect, out of date or incomplete. Mr Millman said the protection of private information was competing with rapid advances in technology for information gathering, storage and sharing.